Avicenna is a 2-year EU funded project, led by DG Connect that run from Oct 2013 to Sept 2014. 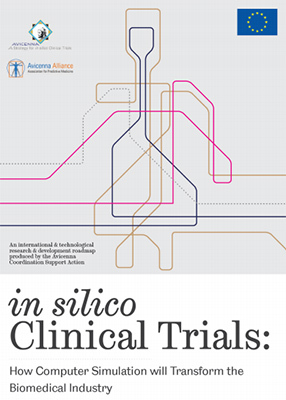 The project goal was to create a research and technological development Roadmap outlining a strategy for in silico Clinical Trials (ISCT). The VPHi was one of the project partners, together with University of Sheffield, Linkeus and Obsidian, tasked with the main goal of developing a pre-competitive Alliance for in silico clinical trials. The beginning of the 21st century saw the birth of a completely new way to investigate living organisms through computer simulations, called in silico medicine. Through a number of consultation meetings with the complex community of reference, the project explored how computer simulations can be used to improve clinical trials of drugs, devices and biotechnology products. Along side to the roadmap delivery, the VPHi was tasked by the EC with a second project goal: the establishment of a pre-competitive industry- academia association that would have focused to increase the collaboration between academia and the industries in the in silico medicine field so to ensure a faster adoption track of VPH research technologies. The Avicenna Alliance was successfully created by the VPHi and since 2016, working toward the implementation of the Roadmap and to identify policy and regulatory obstacles to the enhancement of in silico medicine.